My friends invited me on a trip, which includes a visit to Disney world. This adults only trip has been a fun adventure. For the past two days I have been flooded with memories of the visit I made with my three children. I remember my daughters Tinkerbell earrings and Minnie Mouse hat. I remember Logan’s love for Goofy and the Tower of Terror. Tonight we had dinner at a restaurant which included character visits to our table. When I saw Goofy, i was surprised by my anxious emotions. I wanted to turn my head and say "no thank you." Instead, I choked back the tears and forced a smile. No one wants to cry at Disney world! It is supposed to be the happier place on earth. Because I am with others, I needed to quietly sit and wait until I could make my escape... escaping from the uncomfortable memories. Then Donald Duck came to visit the next table with two excited preschoolers. As I watched the young parents guide them towards this character, I began to relax. 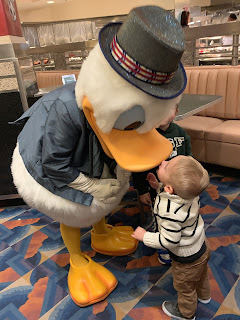 When the littlest one kissed Donald Duck, I captured the most precious picture. I remember being a young mother taking my children to a character dinner as well. I remember the excitement and joy of my family- including Logan. This memory as well as the present made me smile. It is a mixed bag of emotions that swirl together to make life. Every day we can make a choice to avoid the uncomfortable. When we choose to do this, we also choose to avoid the joy in life. I am glad that I faced the emotional memories because I want to remember Logan. I want to remember and never forget... continuing to honor Logan by choosing joy. Love this so much! You can never go wrong with choosing joy and I know Logan would agree. It is so important to let the pain and grief in, acknowledge it, and rise. Love you sweet friend! PS... let’s plan a girl weekend soon please!